This week on the Great British Bake Off, they made Yorkshire puddings, lace pancakes and churros. The churros appealed to me the most this week, as I’ve never actually tried them due to all the street vendors covering them in cinnamon sugar. 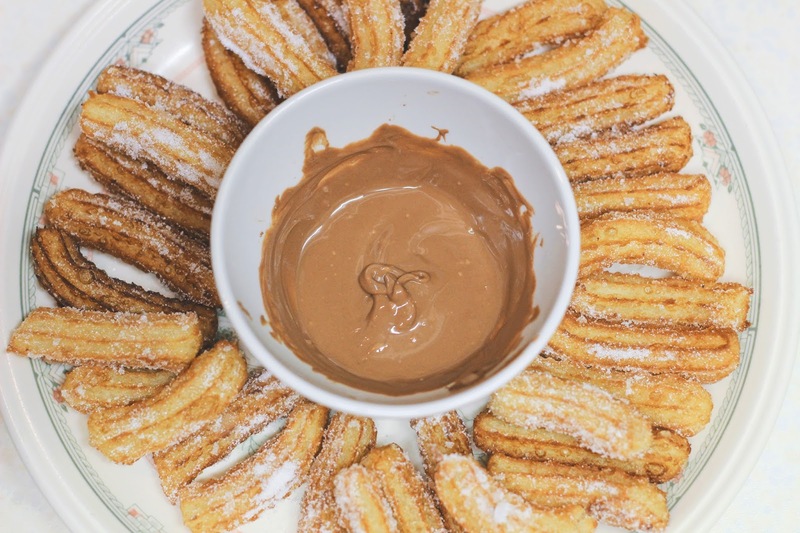 It’s always risky making something you’ve never made before and as you can see my churros are not ‘uniform’ in the slightest and actually some were raw in the middle (which unfortunately I found out by biting into one). I didn’t make the chocolate dipping sauce in the recipe or add the cinnamon to the sugar, I just melted a bar of Dairy Milk to dip them in haha. You can find the recipe here. 1. Boil the kettle, then measure 350ml boiling water into a jug and add the melted butter and vanilla extract. Sift the flour and baking powder into a big mixing bowl with a big pinch of salt. Make a well in the centre, then pour in the contents of the jug and very quickly beat into the flour with a wooden spoon until lump-free. Rest for 10-15 mins while you make the sauce. 2. Put all the sauce ingredients into a pan and gently melt together, stirring occasionally until you have a smooth shiny sauce. Keep warm on a low heat. 3. Fill a large deep saucepan one-third full of oil. Heat until a cube of bread browns in 45 seconds – 1 min. Cover a tray with kitchen paper and mix the caster sugar and cinnamon together. 4. Fit a star nozzle to a piping bag, 1.5-2cm wide is a good size. Fill with the rested dough, then pipe 2-3 strips directly into the pan, snipping off each dough strip with a pair of kitchen scissors. Fry until golden brown and crisp, then remove with a slotted spoon and drain on the kitchen paper-lined tray. 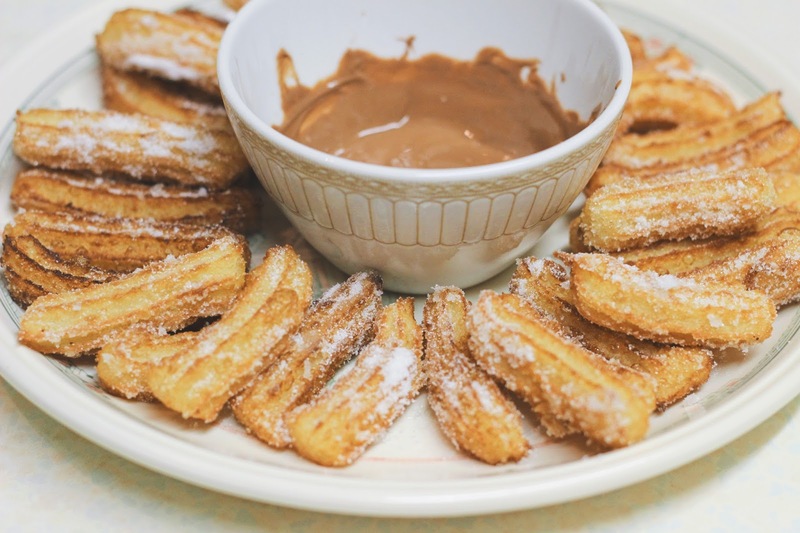 Carry on cooking the rest of the dough in batches, sprinkling the cooked churros with some cinnamon sugar as you go. 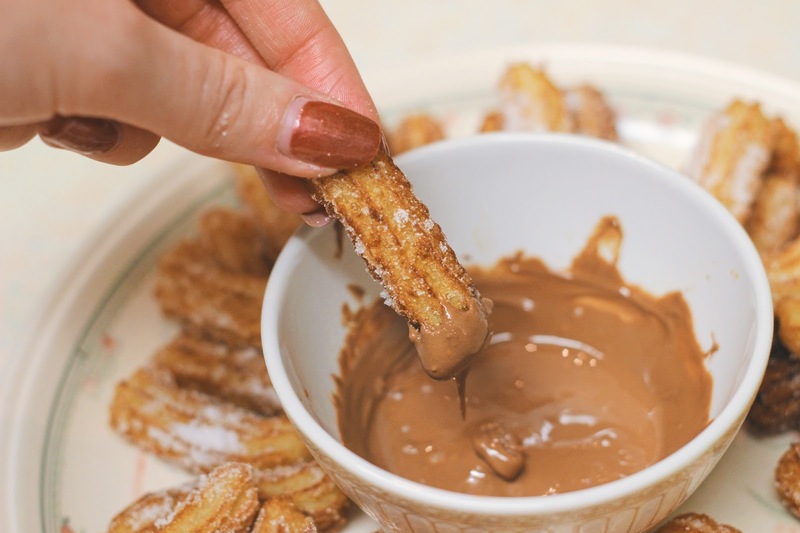 Once you’ve cooked all the churros, toss with any remaining cinnamon sugar and serve with the chocolate sauce, for dipping. 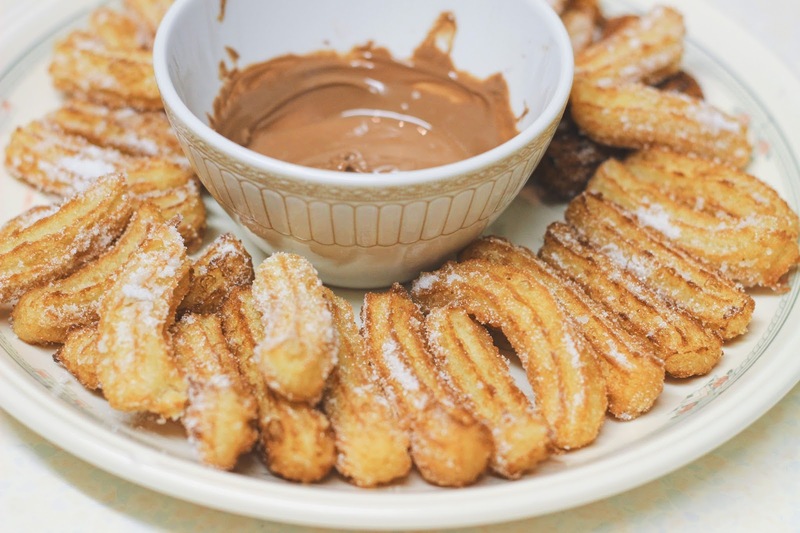 Do you like Churros? Have you ever tried to make them?